In this book the famous madness of King George III is explained with the theory of a rare metabolic disease that taints the entire royal English bloodline. Before I bought this book I read some of the Amazon reviews, which mostly said that it was very clinical and would be boring to everyone except people who have this disease (porphyria) and want to learn more about it. That turned out to be one of the most untrue statements I have ever read! I'm so glad I took a chance with this book (not much of a chance though, given that the book only cost a dollar) because it was so entertaining and exciting that I could hardly bear to put it down. 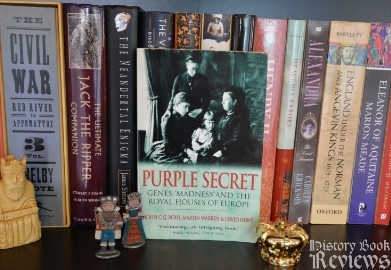 Purple Secret reads like a historical detective novel, trying to uncover evidence of a secret debilitating genetic disease in the royal line of England, except it's not fiction. The disease is porphyria, an incurable metabolic disorder of the blood that produces many highly unpleasant-sounding symptoms, including violent abdominal pain, neuropathy, skin lesions and rashes, dark red or blue urine, and mental disturbances. In the 1960's the theory was first made that King George III, traditionally called "The Mad King" and long believed to have had some pretty deep psychiatric issues, actually suffered from porphyria, which could have caused all his symptoms. In this book the researchers painstakingly peruse every contemporary written record describing the King's illnesses and compare them to the symptoms of porphyria, and make a fairly convincing argument that he had it. King George III, 1738-1820. Perhaps his 'madness' was caused by porphyria. But their detective work did not stop there: Porphyria is a highly heritable genetic condition, so the book catalogs the lives and illnesses of over 20 other members of the royal family from the 1700's to the 1940's. 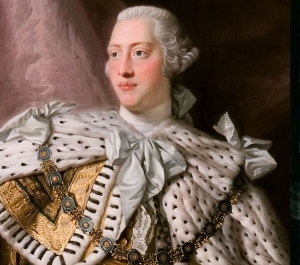 It turns out that a huge number of subsequent royals have suffered suspiciously similar symptoms, from George III's children to the current royals in the House of Windsor. The authors use personal letters of these figures showing detailed descriptions of their symptoms, and it is amazing how many of them had the same undiagnosed and horrific symptoms, which strongly points to hereditary porphyria. They also had some other problems, and this book contained one of the most disturbing things I've ever read before: A description of one of the earliest attempts at artificial insemination and its horrifying consequences. 1910 was NOT a good year for gynecological procedures. Porphyria is an odd disease, and it is a dominant one as well, requiring only one copy of the defective gene to pass itself along. However, it has a high latency value, with around 90% of people with porphyria never displaying any symptoms. For this reason the authors argue that it is still prevalent in the royal family today, even if they do not display the symptoms. When the theory was first advanced in the 1960's, the researchers report shockingly rude responses to their requests for testing to prove the theory...but this was understandable, as they were actually writing to living royalty requesting their urine and stool samples for testing. Did they really think that would go over well? The researchers also undertook a DNA study to try to prove their theory, and, unbelievably, got permission to open the graves of two members of the German royalty who were descended from the same line. I won't give away the results, but they are very persuasive. However, it's good to keep in mind that this book is from the 1990's, when DNA analysis was still very much in its infancy. I was fascinated to find out what further studies they might have done in the decade since the book's publication, but so far I've found very little. Disappointing! The idea that George III or any of his descendants suffered from porphyria is still hotly debated. I will admit that I am quite convinced that they did, and I found the evidence in Purple Secret very compelling. But nothing is proven, and nothing can be proven (unless some kings and princesses in the future decide to publicly submit the products of their bowel movements to medical science...but I'm not holding my breath on that one). Nevertheless, this book is immensely intriguing and exciting. Even if the theory gets proven wrong someday, Purple Secret takes you on a wild ride of guilty pleasures, digging through private letters of long-dead royalty that describe their secret crippling illnesses and the possibility that an insidious disease lies lurking in the bloodline of the royal family to this day. All in all, this was undoubtedly the best dollar I have ever spent. King George IV in his younger and (slightly) healthier years. It is no small wonder that the current royalty does not want to submit samples for porphyria testing, when modern science is somewhat less than discreet. If they were ill, I can't imagine the royals wanting their symptoms published, like they are for the subjects in Purple Secret. Poor George IV, the son of George III, would probably have cried if he knew the general public would one day know all about his "ugly swollen glands and purplish oedema on and under the skin of the neck"; his "violent stoppage of the bowels with excruciating abdominal pain"; his "sores and watery blisters all over his body"; and his "spasmodic vomiting". He probably also would not have wanted anyone to know what was found in his autopsy, that he had "a clot of pure blood, weighing about six ounces" in his stomach, a "solid inflammatory deposit of the size of an orange" in his colon, and that the valves of his aorta were "ossified". Considering that George was so self conscious of his appearance and illness that he forbade people from looking up at the castle windows in case he might pass by and they would see him, I can't help but feel bad about his lack of privacy. As much as I may want to know if porphyria is in the royal bloodline, I can understand their reluctance to submit their bowel movements for medical testing.